In today's digital era, the majority of new knowledge assets are in digital form. And keeping these knowledge assets secure and available has become a major issue. Thecus N4100 is a next generation network storage appliance designed to tackle this challenge. It provides an easy-to-use, affordable, and secure solution for storing, sharing and managing digital data. Terabyte-level network storage appliance with SATA (Serial ATA) technology and Gigabit Ethernet connectivity. 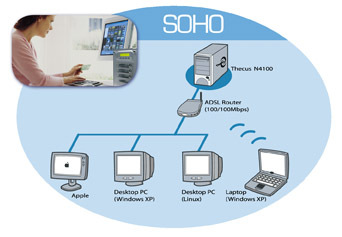 N4100 is tailor-made for computer enthusiasts and the small office/home office (SOHO) users who face the following data storage issues. How could I increase the capacity of my data storage without technical hassle but with an affordable cost? What would happen if my hard drive crashes? How could I share the data with other people? How could I manage the data in a multiple PC environment? How could I store and backup the data in a reliable device? Based on Intel's I/O processor architecture, N4100 is designed to offer larger storage space, better data security, higher data access throughput, but with lower power consumption. Most households and small offices have more than one PC. However,this multiple PC structure doesn't allow people to find, share or consolidate files easily because the data are scattered in different PCs. In order to solve this problem, N4100 is architected to act as a central data server. Users using different operation systems are able to read, write and execute the files saved at N4100 by network. For example, a secretary saves a document at N4100 for his/her co-workers to review. His/her co-workers can simply access via network the document and make comments. 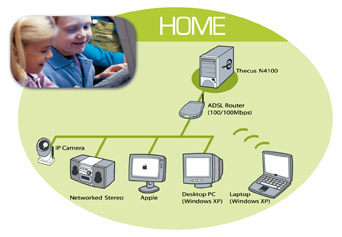 For another example, in a home environment, when kids keep their MP3 songs, video contents and gaming programs at N4100, they will be able to share and combine their individual digital collections in a centralized device. Furthermore, they can access their digital archive via network simultaneously. N4100 emphasizes the pay-as-you-grow model with your business growth and the expansion of your personal digital archive. You could add hard drives one by one when the existing capacity is run out*. For example, you could place two hard disks at N4100 at first because of budget concern. Later on, when the storage space is not sufficient, you add another two.When a single Terabyte N4100 is too small to accommodate your data, you add another N4100 to the existing network, and then you gain one more Terabyte. Since N4100 is network based, it grants you unlimited scalability. Using Thecus N4100 as your data server is the smartest way to minimize IT management and secure your precious asset. In order to provide high data reliability and high data throughput, N4100 adopts the next generation hard drive technology, SATA, and Gigabit connectivity. With four-bay design, N4100 helps users easily gain Terabyte-level storage space. Although Thecus N4100 has terabyte capacity and Gigabit connectivity, Thecus N4100 is energy-saving. 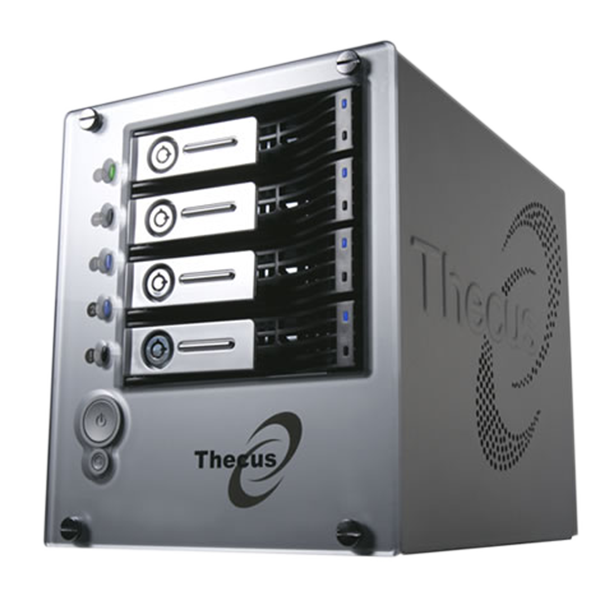 Compared to traditional file servers, Thecus N4100 saves more than 35% energy. Since Thecus N4100 is designed as a special purpose appliance focused on network and storage, unnecessary power consumption is eliminated.